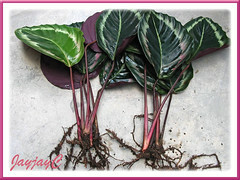 Just to illustrate how Calathea roseo picta can be easily propagated by division. Our lovely cultivar ‘Eclipse’ had blossomed last October and having seen how fabulous its flowers were, we thought it would be wonderful to multiply their presence in our garden. Rather than buying new plants, we decided to separate our existing plants into 2 pots. How-to propagate by division? Very easily done in a jiffy! Use a garden spade to gently dig out the clump of plants from its existing pot. Then carefully separate the plants with your fingers, ensuring that each division has a few plants and roots intact. 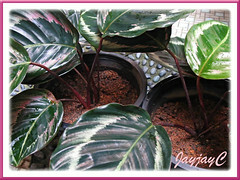 Replant each division in individual pots filled with potting mixture, preferably fertile organic soil with a mix of sand. Ensure that the soil is firm around the roots and crown. Wet the soil thoroughly and allow it to drain. Place the pots at a shady place in the garden. Allow soil to slightly dry before watering again as overwatering can easily cause root rot as the newly planted plants try to acclimatize to their new home. 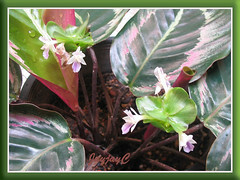 See plant profile on Calathea roseo picta here.